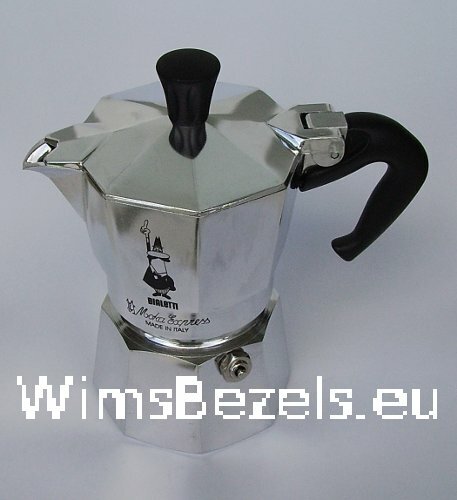 You can find a good Bialetti espresso pot, in this (espresso maker) web shop. There are several beautiful, good coffee-makers, or coffee pots, from Bialetti. The Bialetti espresso models really are surprisingly nice! Do have a further look in this espresso coffee web shop. There is a Bialetti espresso pot for you in the right size. price 2 cup: euro 17.75 incl. vat. in NL. price 2 cup: euro 21.55 incl. vat. in NL. 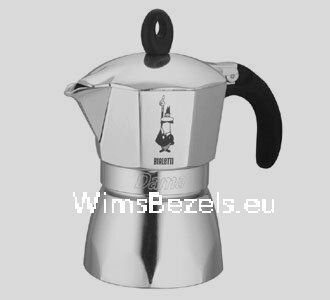 The Bialetti espresso makers above are made of polished aluminium. Bialetti manufactures a better espresso coffee maker than many others do. The prices in this web shop are inclusive of the Dutch VAT and exclusive of shipping costs. All other costs for sales abroad, like taxes and duties, are exclusive. No guarantees are given relating to accuracy. Copyright © Dec. 2007 - 2019 by WimsBezels.eu, The Netherlands.